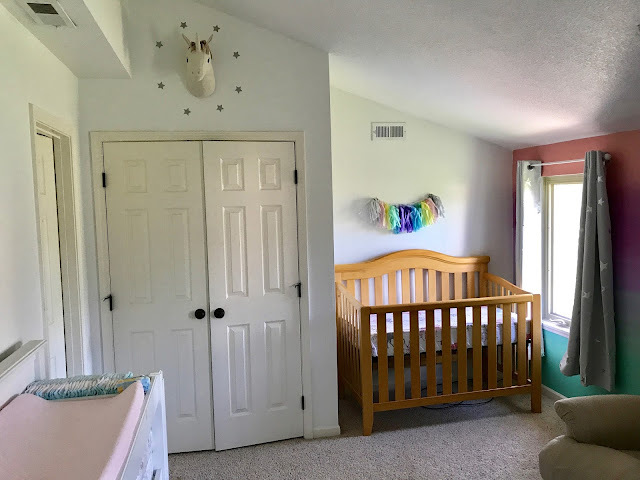 I am now officially two days over my due date, so I thought I would pop in to give you an update and a nursery tour. I had a midwife appointment and ultrasound yesterday, where everything looked great. Baby Girl was moving and scored perfectly and all of my numbers are right on track. I am only dilated to a "loose 1" so I had my membranes stripped (this can help speed up labor, particularly if you are overdue) and am scheduled to be induced bright and early on Monday morning (one week overdue) if nothing has happened by then...which is looking like will be the case. I continue to feel random contractions, some a little stronger, but nothing even close to labor. 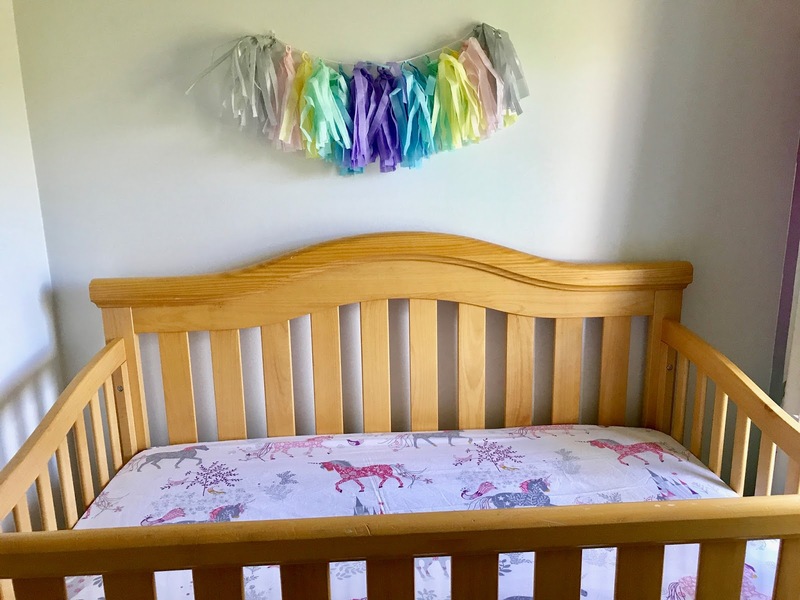 The anticipation of going into labor is one of the weirdest feelings. I know that my world can and will completely change in a matter of hours, but I don't know when. So, I just wait, and every day think, today could be the day! I spent most of last week just waiting, which seemed to drag it out. This week I have decided to try to plan a few things to break up the waiting. 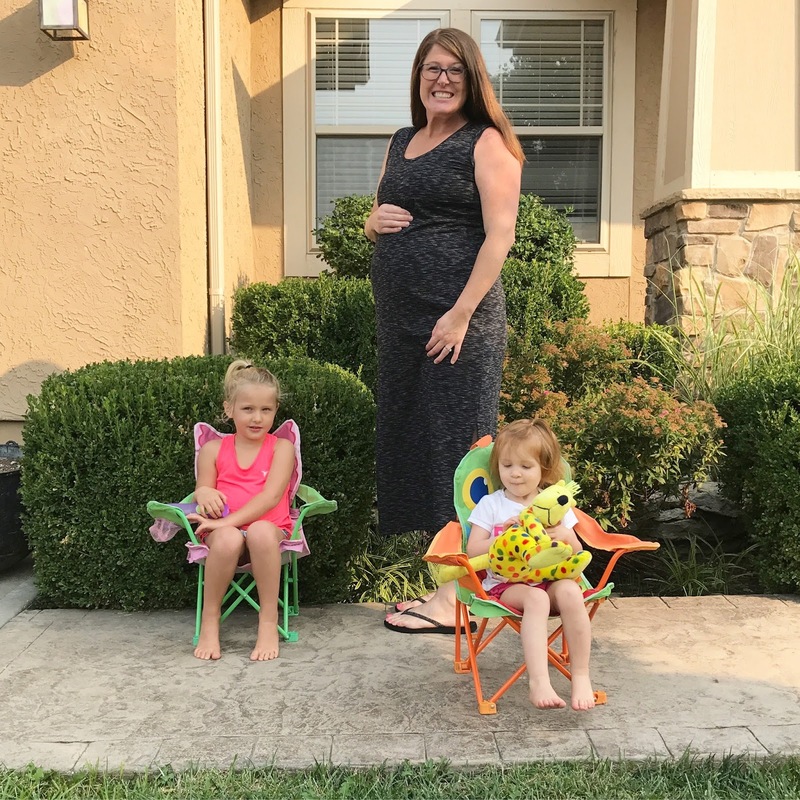 I suppose people will understand if we need to break plans because I am having a baby. Ha! I didn't get too elaborate, most of it was done by other people. My aunt ombre painted one wall using this tutorial. The pictures really don't do it justice. It is so pretty in person. 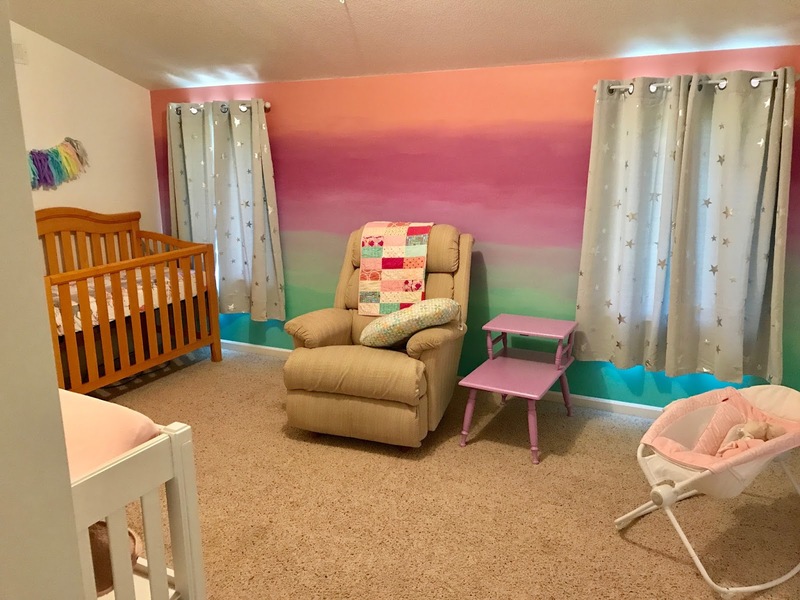 Our sweet neighbor/friend gave us that quilt she made that matches the room perfectly. I ordered these blackout star curtains from Amazon. I made the tassels above the crib using this tutorial. My dad's girlfriend made this unicorn into a wall decal. 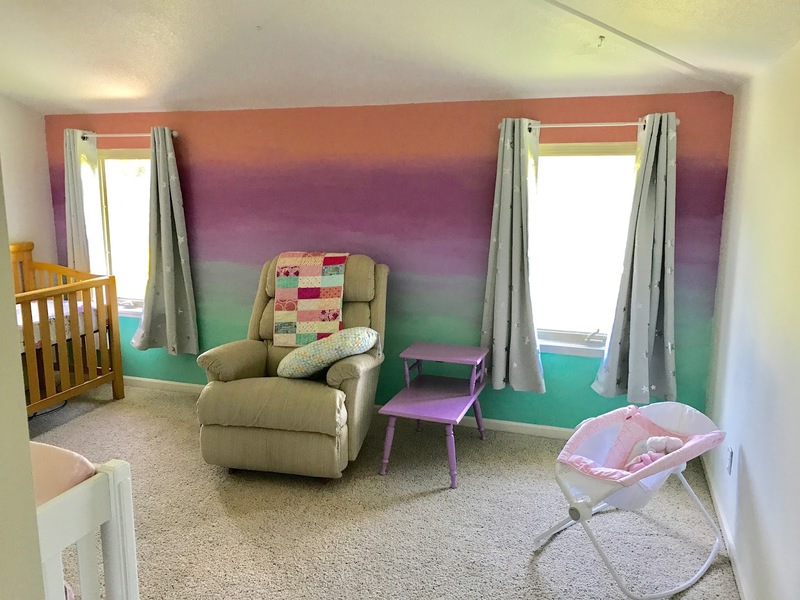 Granny helped paint the room, painted the purple table, and helped sort the clothes. The crib, changing table, Rock N Play, and rocker are all second hand, so I think I spent less than $300 on the entire room! 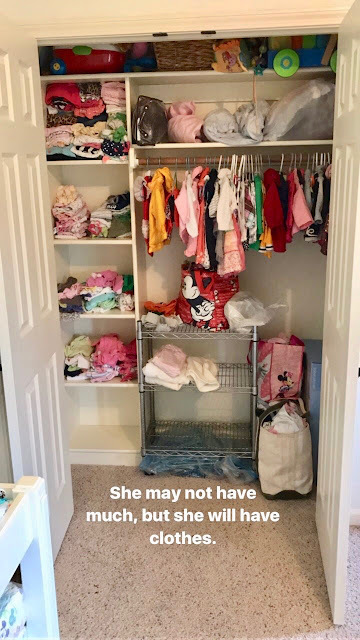 Oh, and her closet is fully stocked, sorted, and organized for her first 12 months of life. 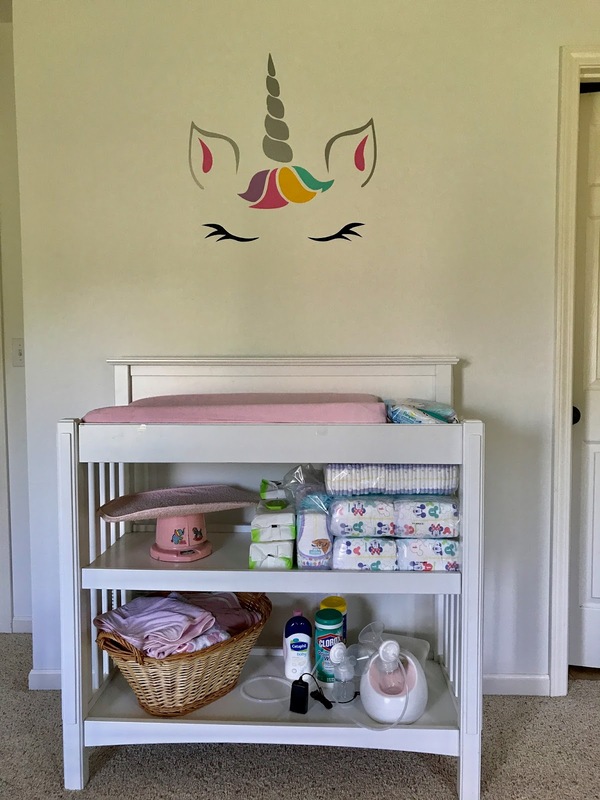 The Unicorn Nursery is beautiful! Hope everything goes smoothly!